Happy Bloggers Challenge Friday! Thanks to those who played along with the Splash of Color Challenge, I always enjoy seeing what "splash" everyone adds to their projects! The challenge this week is Anniversary or Wedding. Yep, another one of those challenges that I throw in when I'm in need of that type of card! My husband and I are celebrating 23 years on Sunday, so I used this challenge to create a card to give him for our Anniversary. I tried to keep it on the "masculine side" but as you can see I struggled a bit and added pearls! To create my card I used papers from Authentique, stamps from Verses and Our Daily Bread Designs and Zva Creative Crystal Gems. 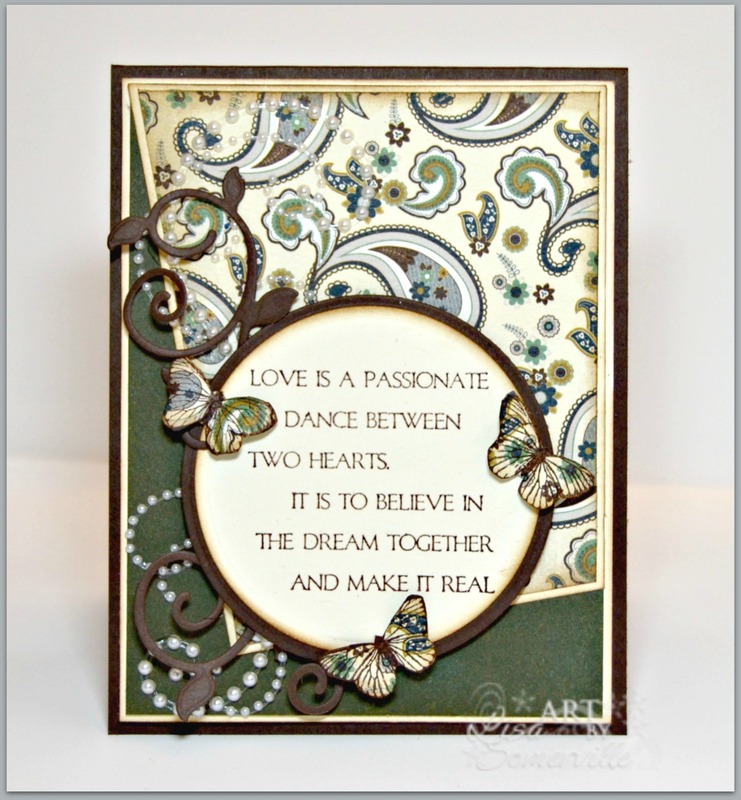 The sentiment is stamped in Chocolate on Vanilla card stock then die cut and layered on an Espresso panel. To embellish I added Zva Creative Gems, an Espresso swirl die cut using Our Daily Bread Designs Custom Fancy Foliage Die and butterflies stamped on pattern paper using Our Daily Bread Designs Stamped By - Butterfly Mini. If you'd like to play along with this weeks Bloggers Challenge, please link back to this post on your blog and mention you created your card for the Bloggers Challenge Anniversary/Wedding Challenge. Please add your link using the Link Tool below, your link should be a direct link to your Bloggers Challenge Post, use your name as the Title. Please do not link to cards that were created prior to the challenge date. Entries not linking properly, or backlinked will be removed. If you have the captcha enabled on your blog, please consider turning it off, as it makes it so much easier to leave comments. Interesting layout on this beautiful card! Happy 23 years. Seems like yesterday. Happy anniversary, Lisa! Lovely design! Happy Anniversary! I hope you have a great day! Beautiful verse and card!